Color : White . 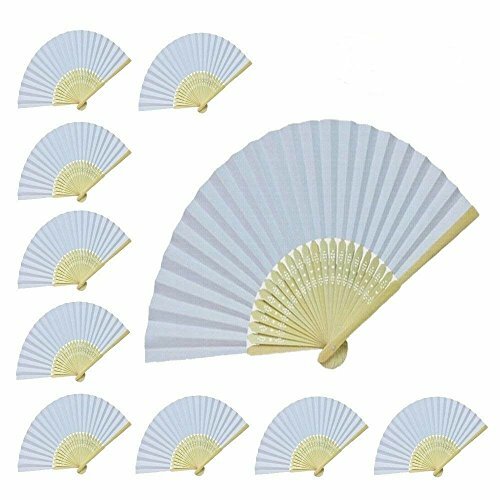 Material: Silk Fabric and Bamboo Ribs Size :Width ( when open ): 37cm (14.6"), Length of Bamboo Ribs: 21cm (8.3"), Radius of silk cloth: 10.5cm (4.1"), package : 10 pcs 100% Brand New,High Quality ,Silk Hand Fan,Fits in your Handbag Perfect for Bridal Wedding,Party show,Concerts,Theatre,Halloween,Christmas Holiday,Props for making photos Note : the photos may not reflect the actual color of the product because of the different monitors,it is normal,thanks. Quantity: 10 count, Measurement: Folded 8.27" * 0.98" Open 8.27" * 14.57"
If you have any questions about this product by WEN FEIYU, contact us by completing and submitting the form below. If you are looking for a specif part number, please include it with your message.